educational Certificate Copies with Pass Port size Photograph to college address given below for Mohamed Sathak Hamid College of Arts and Science for Women Assistant Professor / Accountant posts. For these jobs can apply from 27-03-2019 to 03-04-2019. More Information can refer the official website http://www.sathaktrust.org/. Remaining details like Salary, Important Dates, Availble Vacancies, Qualification, College Address are given below. 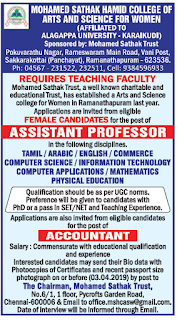 Starting Date to apply for Assistant Professor / Accountant Jobs: 27-03-2019. 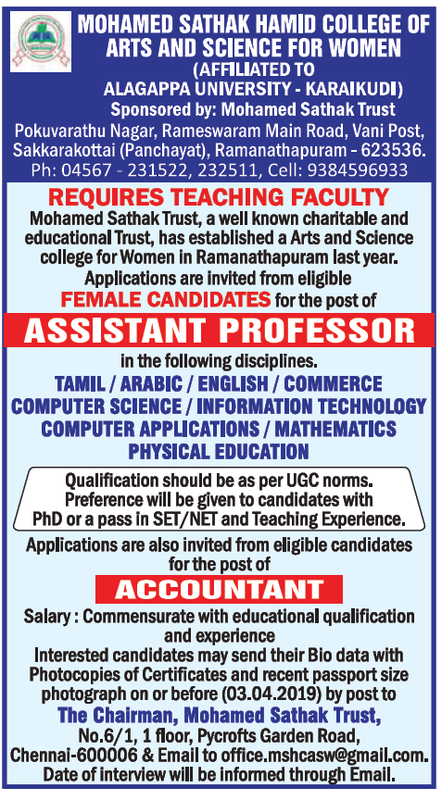 Ending Date to apply for Assistant Professor / Accountant Jobs : 03-04-2019.